Steve Mozingo, center, led Fellowship Missions residents in prayer after distributing packs of thermal socks. WARSAW — Two organizations focused on giving back to the community and helping others came together today, Feb. 11, to celebrate a donation of an article of clothing that many take for granted. Sky Footwear, an organization started in a Taylor University dorm by Keaton Hendricks, donated 870 pairs of thermal socks to Fellowship Missions, Warsaw. Each month, Sky Footwear chooses a homeless shelter to support through sock donations. For the month of January, the organization chose Fellowship Missions as their partner for the month. From Jan. 1 to 31, every pair of socks purchased from the Sky Footwear website was matched in donations by the organization and donated to Fellowship Missions. Before delivering and distributing packs of socks, Hendricks and Sky Footwear staff members prepared lunch for the shelter’s residents. 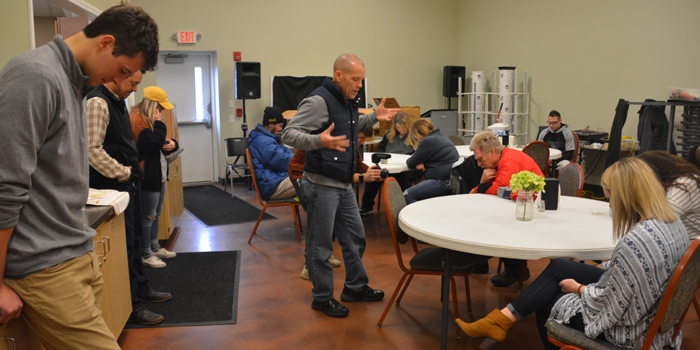 “Our hope and our prayer that we hope you’ll remember is that the Lord, who through Sky Footwear and Fellowship Missions, provided you with something,” said Steve Mozingo, Sky Footwear staff member. Mozingo also discussed the growth Sky Footwear has made in the past year. In January 2018, the organization donated 227 pairs of socks to an organization but were able to quadruple that number this year. 870 pairs of socks were donated to Fellowship Missions.